I'm going to kill myself, Mama. I'm just not having a very good time and I don't have any reason to think it'll get anything but worse. ---Jessie Cates. Some actors leave an indelible mark on roles that they create. Case in point, Kathy Bates and Anne Pitoniak as Jessie and Thelma Cates in Marsha Norman's Pulitzer Prize winning 'night, Mother, a ninety-minute argument for and against Jessie's intended that also reveals the lifelong complexities of the mother-daughter relationship . But that's not to say that any actor ever owns a role to the extent that a play can't continue to move audiences without the original key player(s) on hand. If that were the case, we would have neither regional theater or revivals to expose new audiences to still relevant dramas. And so, while there will always be some who insist on using the original role players as the standard against which to judge a new production, the just opened revival of night, Mother features Edie Falco and Brenda Blethyn, a duo with strong box office appeal and the acting chops to make us care about the characters -- again, or for the first time. That brings us to whether the play itself holds up. Unquestionably, Norman's many trenchant exchanges are still powerful. However, there are those who never bought the idea that Jessie would be contained and organized enough to bustle around as she dissects years of pain and hurt with her not too tightly wrapped mother before pulling the trigger. This still holds true for this writer, and probably most experts on clinical depression. A second-time viewing will also make it more difficult to experience the same suspenseful punch to the heart, tear evoking impact. Granted there never was any question that this was a play about suicide. The tension never really stemmed from will she or won't she as much as from watching Jessie clean and load the gun with which she plans to kill herself as casually as she goes about performing various housekeeping tasks like taking out the garbage or refilling the candy jars (does anyone really keep this large a stock of candy, no matter how sweet the tooth?). Along with all this tidying up there's also the simultaneous small talk (e.g. the disappointing taste of the mother's homemade cocoa) and the sumup of years of disappointments and pain that made life no longer worth living. My reservations about the play's psychological authenticity notwithstanding, there was one interchange that moved me more and quite differently now than twenty years ago. 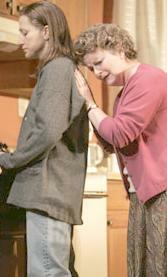 That's when Thelma, realizing that Jessie really is serious about killing herself cries out "but you are my child" and Jessie responds with "I am what's become of that child!" As a mother and grandmother, those words brought me as close to tears as anything, even though for most parents what's become of that child is not necessarily a dysfunctional, but the years do bring physical changes and pain from which we can't protect that child. If memory serves me, Bates was the more showy and volatile character. That seems to have been reversed in this production. For Edie Falco this is also the second time she's stepped into a role most closely identified with Kathy Bates. Two years ago she appeared in a revival of Frankie and Johnny at the Clair de Lune (Our Review). But as Falco doesn't resemble Bates at all, so in playing Jessie she once again puts her own spin on the character. As the unhappy fortyish epileptic who failed at marriage, motherhood and minimum wage employment, she's a less high-strung version of the alcoholic wife in Warren Leight's Sideman. Her unsmiling, sad-eyed face is devoid of even a lick of makeup. The flat, monotonous speech matches her appearance -- mousy-colored, stringy hair (courtesy of wig wizard Paul Huntley) and a baggy gray sweater to camouflage her body. In short Falco embodies a woman who has given up on life as anything remotely resembling fun and optimism. Blethyn, being British, has the challenge not only of matching the excellence of Pitoniak's Thelma but sounding like an American. And so she does. The accent may be a somewhat odd mid-American hybrid but it's fine. Most importantly, her performance is superb. She nails the tricky psychology of a woman who's been ineffectual in her marriage, her mothering and in just plain coping with day to day life. She is one of those people who don't deal with problems head on and who fail to listen to cries for help until it's too late. Watch her reach for that phone again and again rvery time Jesse leaves the room and you see a woman who wants desperately to prevent her daughter's suicide. At the same time you see a woman who has been incapable of acting forcefully all her life. Her reaction to Jesse's announcement ranges from platitudinous disblief to hysteria and, finally, a steely calm. Michael Mayer directs with a sharp eye on the ticking clock that gives the play its disquieting dramatic jitters. Unfortunately he also allows Falco's rummaging around Neil Patel's carefully detailed living room and the kitchen (which looks a bit too spacious and recently renovated for this slice of anywhere-Americana) to overwhelm the emotional undercurrents. According to Chekhov, a gun seen in a play's first act, must go off before the curtain goes down. For readers who've never seen 'night, Mother who have managed to miss having someone tell them how things end, I'll refrain from telling you whether his rule applies to single act intermissionless dramas.